After completing our drive down the Blue Ridge Parkway and tour of the Great Smoky Mountains National Park, my grandparents and I decided not to return to DC over yet more mountains, either by repeating the Parkway or going through Tennessee and West Virginia, but instead to loop back via Virginia Beach and Ocean City. My grandmother loves the ocean. I love seascapes as well, but of a certain kind: rocky or pebbly beaches, pounded by crashing waves, with soaring cliffs overhead -- promising adventure. A flat coast with a sandy beach, offering relaxation instead of challenge, without much diversity of natural features, appeals less to me. 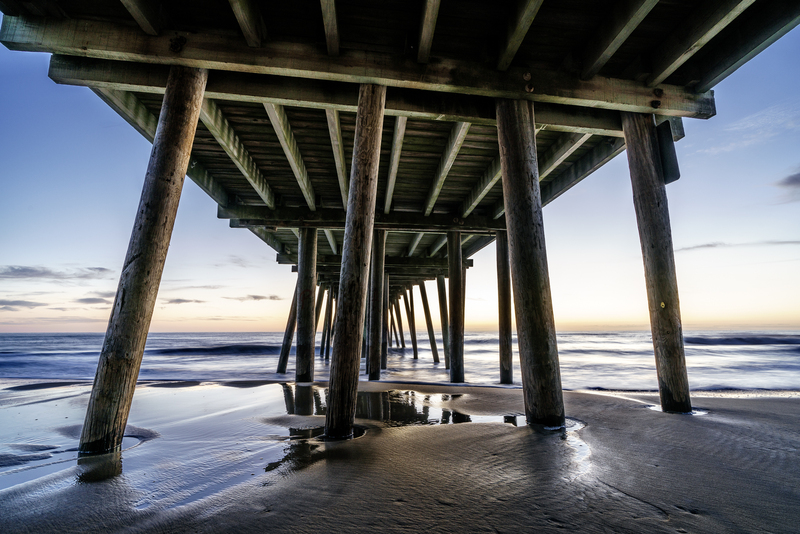 As the sun rose at Virginia Beach, however, I spied a fishing pier that I enjoyed incorporating into my shots. Usually when developing my pictures in Lightroom, I prefer the Camera Standard color profile. But for this photo, I tried Camera Deep and liked how it looked.